Coventry Kersey Dighton Patmore (1823-1896) was an English poet and critic. He is one of the best-regarded Victorian poets. In 1854 appeared the first part of his best known poem, The Angel in the House, which was continued in The Espousals (1856), Faithful for Ever (1860), and The Victories of Love (1862). In 1862 he lost his wife, after a long and lingering illness, andCoventry Kersey Dighton Patmore (1823-1896) was an English poet and critic. He is one of the best-regarded Victorian poets. In 1854 appeared the first part of his best known poem, The Angel in the House, which was continued in The Espousals (1856), Faithful for Ever (1860), and The Victories of Love (1862). In 1862 he lost his wife, after a long and lingering illness, and shortly afterwards joined the Roman Catholic church. In 1865 he married again, and a year later purchased an estate in East Grinstead, the history of which he wrote in How I Managed My Estate (1886). 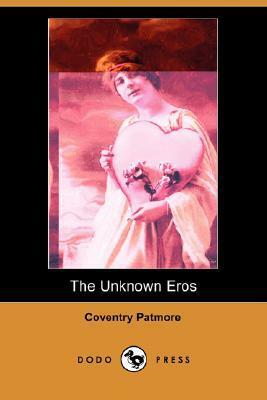 In 1877 appeared The Unknown Eros, which unquestionably contains his finest work in poetry, and in the following year Amelia, his own favourite among his poems, together with an interesting essay on English Metrical Law. This departure into criticism continued in 1879 with a volume of papers entitled Principle in Art, and again in 1893 with Religio Poetae. His second wife died in 1880, and in the next year he remarried. In later years he lived at Lymington, where he died.